After work, Watson came home a little early. Emma was making his favorite meal. She said she had something she wanted to tell him and that she wanted to do it in person. He made sure to get all of his patients taken care of and all of his paperwork done for the day so he could come home at a decent time. When he walked in, the food smelled really good. It helped take his mind off of what Emma wanted to talk to him about. They all sat down together for the meal. Forrest quickly ate his food so he could hurry up and go upstairs to play on the computer. Wasn’t long after he left, Emma and Watson were done and cleaning up the dishes. “Let’s go to the living room to chat” Emma suggested. Emma had such a huge smile on her face. She was so happy. Watson knew she had mentioned this, he just thought maybe it would take longer than a month before it happened. “Are you okay?” Emma was concerned because Watson wasn’t saying anything about the news. “So this isn’t what you wanted? We talked about this I thought you wanted more children too. ?” Emma was really worried now. Just as Emma said that, Watson’s phone went off. He took a look at it. “I have to take this.” and just like that he was up and out on the porch. Watson decided a nice walk through the ruins would help clear his head. He told Emma he needed some fresh air and headed to the ruins. 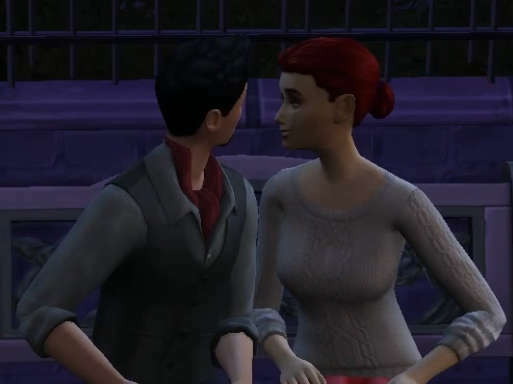 As soon as Watson got there Brenda came up to him and was being rather frisky! Watson wasn’t for sure what her intentions were but a part of him liked it. He missed the freedom of being able to go out and be with who ever he chose. He didn’t exactly tell her no. As the night went on the more friendly they were started to get with each other. Before Watson know it, it had gotten really late. By the time he had gotten home, everyone was already in bed. Oh no! What have I done! What is going to happen with Emma and Watson’s relationship? Keep reading to find out!